Now that February has ended and Black History Month has officially come to a close do we now relinquish our visibility as a people? Do we now go back to subjecting ourselves to the darkness mainstream media cast upon our perception of self, or do we continue to walk in the light? I like the way that Ralph Ellison’s Invisible Man loves light, desires light, needs light. Light confirms my reality and gives birth to my form (Invisible Man, pp. 6). Yet unlike the invisible man we do not have to tragically accept our invisibility. We do not have to surround ourselves with artificial light in our “warm holes” for comfort. We can take it upon ourselves to define and project our own image so bright that it cannot be denied. When I look at the murals of Bronzeville I see a community of artist whose work illuminates those who were made invisible. Each work is an attempt to proudly exhibit that Black humanity does exist and it is worth seeing. Each mural contributes to the effort of reclaiming and reconstructing the Black aesthetic in America. Each mural creates a new aesthetic that is no longer fodder for the oppressive dominant culture but now works in the interest of Black people. I’m always struck by the luscious use of color and allegory in these murals that weaves together the collective Black experience in America. 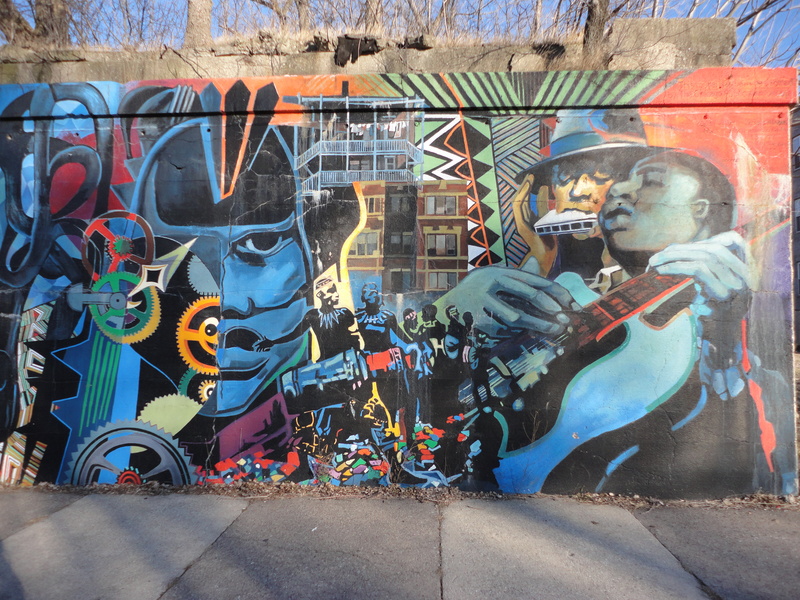 The murals of Bronzeville are not only a representation of a collective experience but also of a collective effort. Time to Unite (41st & Drexel) and the mural on the walls of the Carruther’s Center for Inner City (CCICS on Oakwood & Cottage Grove) are examples of this collective effort. 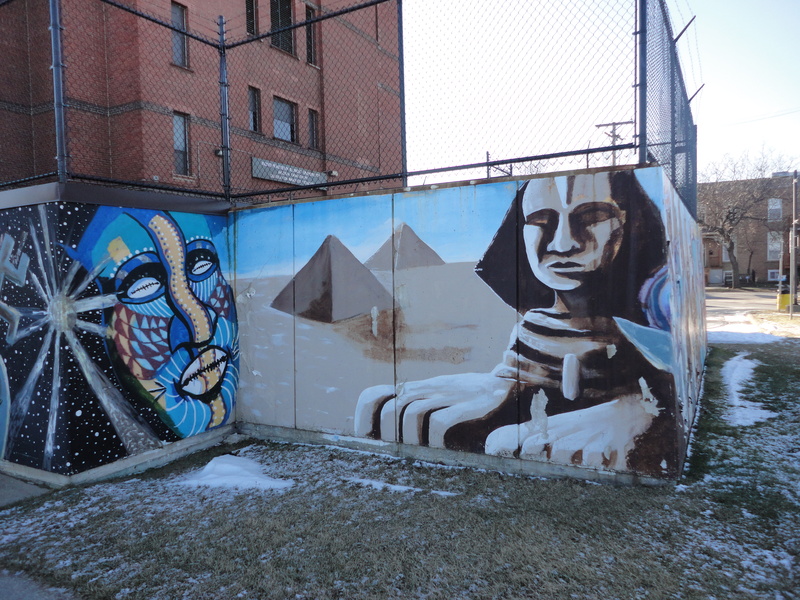 Although there are specific artist credited for these works of art, the community came together to make these murals possible. In fact on the mural of CCICS if you look closely you will see the face of a Bronzeville native, our very own Dr. Zada Johnson. The murals of Bronzeville illuminate the faces, soul, and experience of the people who inspire it. 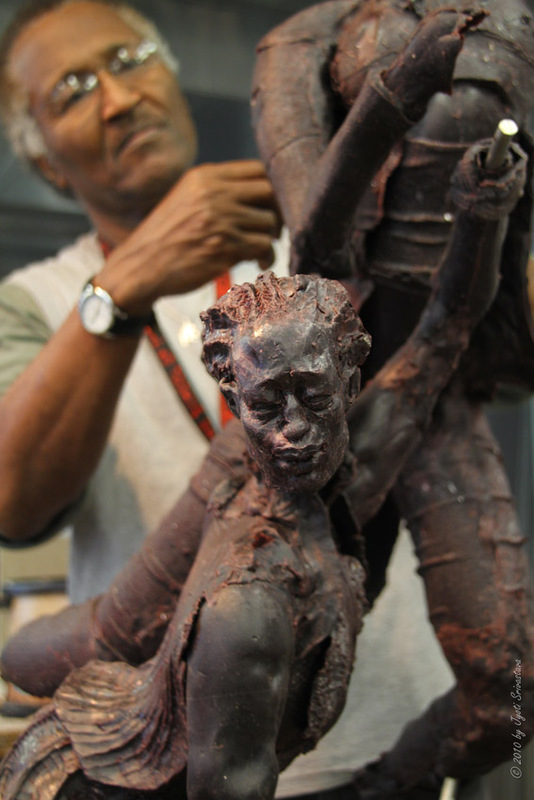 Artist Preston Jackson working on his sculpture entitled "Cakewalkers"
When boarding the 69th Street Red Line stop I’m always greeted by the stately figure of a thirty-something black woman cast in bronze, gently braiding the hair of her adolescent daughter. As a black woman I’m immediately transported back to Sunday afternoons, when I would sit between my mother’s lap as she would comb, part, and twist my hair to be presentable for school the next day. The bronze sculptures, molded by Chicago artist Preston Jackson speaks to me and evokes deep and familial feelings. The stories of African-American life that artists such as Jackson depicts is what I’m most interested in uncovering. Art and artist have always played an integral role in African-American life and especially in Chicago’s Bronzeville neighborhood. Excavating these stories is vital to fully tell the story of Chicago and the people that has shaped this city. The Bronzeville Neighborhood History Project seeks to do just that and this is why I’m proud to be a part of this project. Being a full-time Inner City Studies and Art History major I feel as if this project is the perfect platform to be able to share with the community as a whole what I am learning. I’m originally from Toledo, Ohio, I came to Chicago about 3 years ago in search of fame and fortune through culinary greatness but that was not to be. There was another plan for me and it has been filled with enriching cultural experiences, self- revelation, and loving and beautiful people. With that being said, my Bronzeville experience comes vicariously through all those willing to share their memories with me. Through this project I hope to develop a story of Bronzeville that is personally my own, that I may one day share with an eager young researcher.